Winnipeg artists Eduardo Aquino and Karen Shanski collaborated with the community and worked closely with Winnipeg contractors to realize this project. 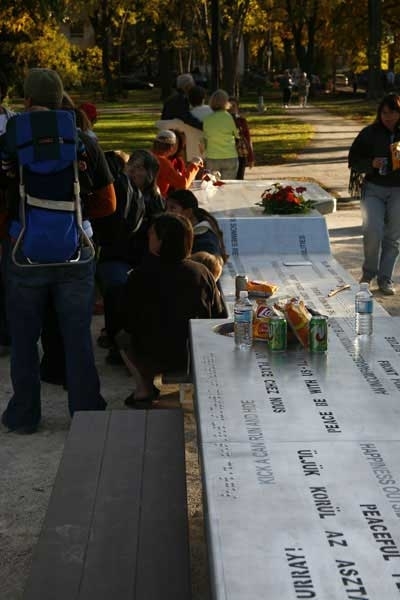 The park features a number of works that memorialize the battle of Vimy Ridge. 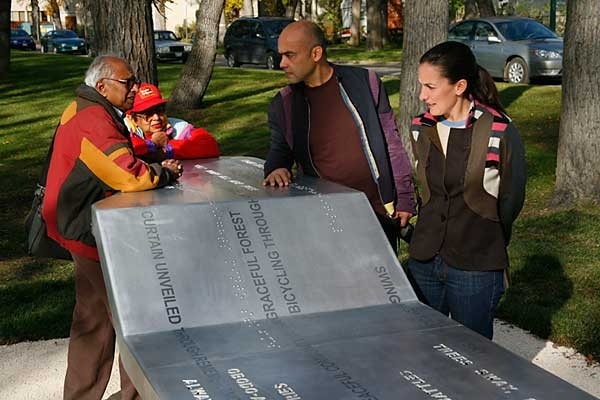 Respecting this historical aspect, the artists chose with their new work to engage the “everyday heroes of the present…it is about the people of Wolseley, the primary users of the park.” Located in the Wolseley area of Winnipeg, the work reflects the famously community-driven attributes of this walkable and garden-filled neighbourhood. 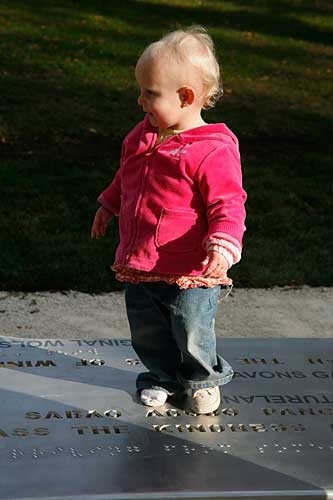 Area residents were invited by the artists to submit phrases which were then inscribed into the sculpture. 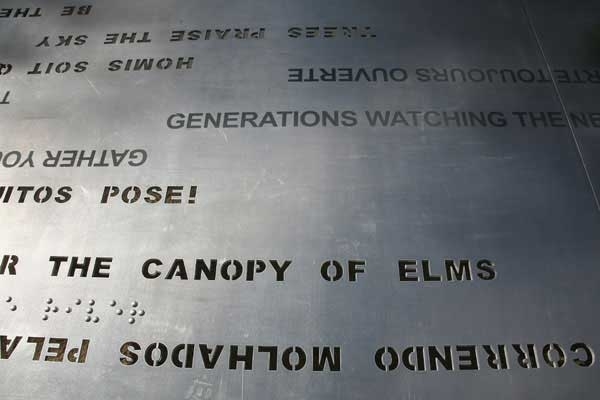 A “landscape of language,” the text reflects upon the importance of the park, the natural environment and the history of the area, and represents a number of languages including Tagalog, Portuguese, French, English, and Braille. The sculpture is located near the convergence of walking paths in the southeast section of the park. The artists responded to a national call for a permanent, site-responsive artwork that would engage park users, address the history, recreation and public gathering aspects of the park and show a familiarity with the community. The Aquino/Shanski proposal was selected from a shortlist of five that included artists from Vancouver, Winnipeg and Toronto. “When getting together around the table participants engage physically, socially and emotionally as ideas, inspiration and a sense of community take place. A table can make a family of strangers connect through sharing, talking, listening, etc. The unpredictable nature of what happens around a table sets the stage for an event to occur – not prescribing the event, but having the community establish it. The words donated by the community…allow the people to recognize themselves around the table by being affirmatively pictured and validated,” notes spmb_projects. 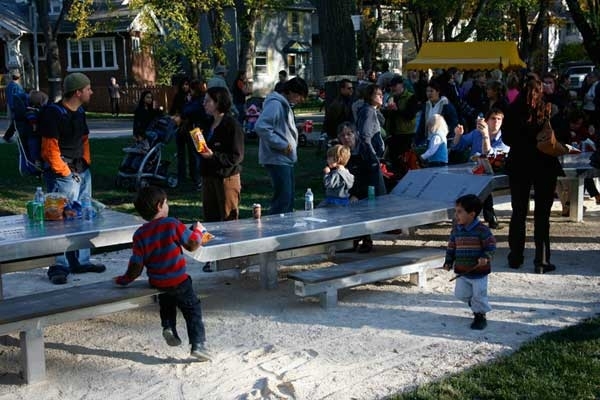 Now an established neighbourhood fixture, one can see crowds of people enjoying picnics and other leisure activities on and around Table of Contents. Eduardo Aquino is an artist whose work has been shown in galleries and public spaces in Canada, USA, Brazil and Europe. 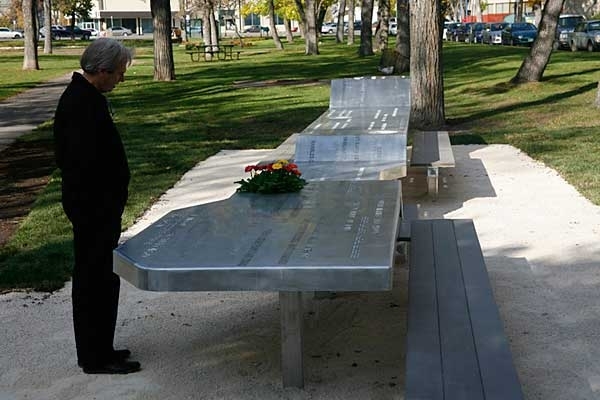 Also a registered architect in Brazil, Aquino is currently teaching art and architecture at the University of Manitoba and has been living in Canada since 1988. Karen Shanski is a University of Manitoba graduate architect who collaborated with Rem Koolhaas at the Office for Metropolitan Architecture in Rotterdam and is currently practicing at Smith Carter Architects and Engineers in Winnipeg. Together Aquino and Shanski collaborate on public space projects through spmb_projects an art/architecture partnership that uses an interdisciplinary and socially responsible approach. Much of their artwork is designed to encourage discussion and to actively involve members of the community. Recent public art projects of spmb_projects include: All the Signs of Pembina Highway, a billboard artwork for Plug In ICA, Winnipeg; Vous Êtes Ici, a reconfiguration of a cultural centre in Montreal that includes a long sculpture inscribed with a map of the neighbourhood's mythologies; and Copan Projects, which recorded the everyday life of a mixed-use building in São Paulo, Brazil, aiming to produce new representations of the structure and its inhabitants.